Source IBA announces its expansion in the Middle East and entry into the Iranian market with the appointment by Mr. Ahad Azimzadeh, Iranian businessman and investor of the prestigious five star Gran Melia Ghoo Hotel currently being developed in the popular resort destination of Salman Shahr on the Caspian Sea. Source IBA announces its expansion in the Middle East and entry into the Iranian market with the appointment by Mr. Ahad Azimzadeh, Iranian businessman and investor of the prestigious five star Gran Melia Ghoo Hotel currently being developed in the popular resort destination of Salman Shahr on the Caspian Sea. Source IBA announces its expansion in the Middle East and entry into the Iranian market with the appointment by Mr. Ahad Azimzadeh, Iranian businessman and investor of the prestigious five star Gran Melia Ghoo Hotel currently being developed in the popular resort destination of Salman Shahr on the Caspian Sea. 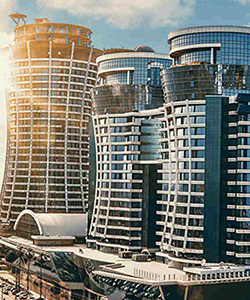 Comprising of 67,000 sqm of interior space, The Gran Melia Ghoo Hotel stands tall at 130 meters boasting 319 luxury guestrooms and facilities expected of a five-star hotel, including seven restaurants and bars, over 1,300 m2 of meeting and banquet facilities, two swimming pools and a spa. Jeremy Stewart, Source IBA’s Executive Director, stated “We are really looking forward to working with both Client and Operator teams in creating a unique design language for this luxury property that will incorporate a modern international design approach with Iran’s rich heritage of both historic and modernist architecture and design influences”. Source IBA’s ability to deliver innovative design and unprecedented value to leading international hotel brands in emerging markets coupled with DSA’s international architecture experience and Manabon’s local presence and experience in the local Iranian market has earned the trust of their partners, further demonstrating themselves as significant international players in the future.